Rodentia - rats, mice, squirrels etc. Lagomorpha - rabbits, hares etc. Insectivora - insect eaters, hedgehogs, moles, etc. Carnivora - carnivores, dog-like, foxes, weasels, stoats, badgers etc. Recorded in the 1982 study of the prey of Short-eared Owl by examination of their pellets. The species is around 83 to 121mm body length with a tail of 38 to 76mm, half as long as the body. Their weight is around 15 to 36g. It differs from the similar species Short-tailed or Field Vole by larger ears, longer tail and reddish-brown fur. 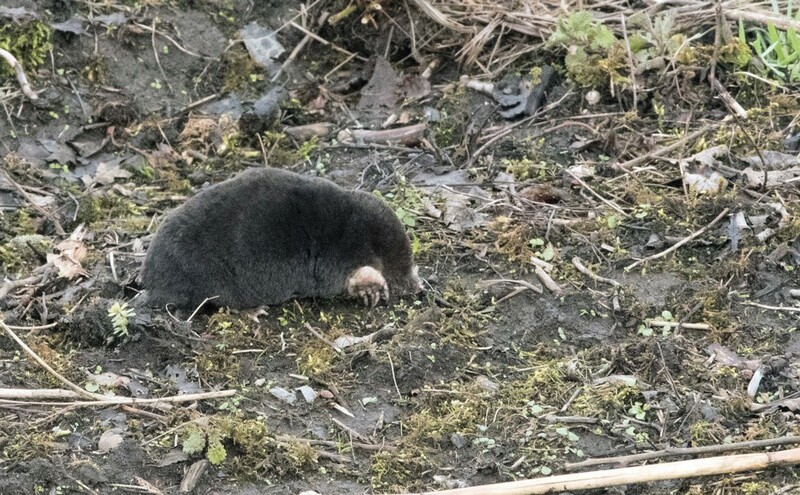 This small vole also known as, Short-tailed Vole, was first officially noted as present in 1979 and breeding has been confirmed during the 1980 Warrington New Town Ecological Survey of 1980 - summary report findings detailed at the end of this mammalia section. Known also as the Water Rat, although similar looking at first glance they are distinguished from rats by the rounder noses, short stubby ears, chubby not sleek appearance and fleshy parts covered with hair - ears, tail and paws. 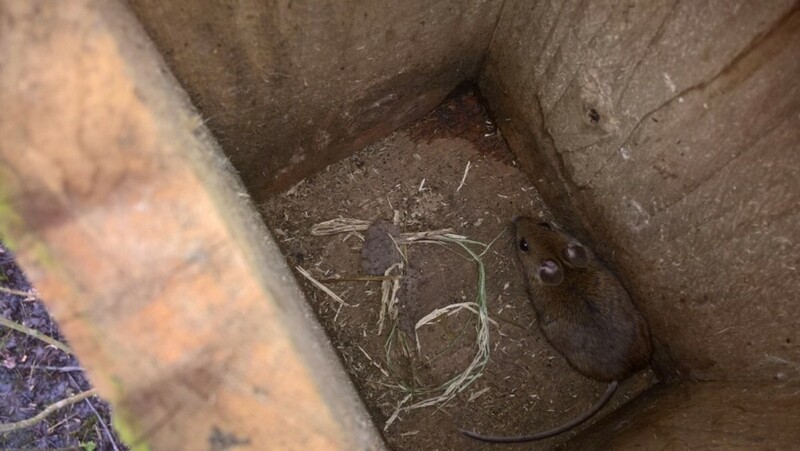 The best chance of seeing Wood Mouse is around the hides on No3 Bed and particularly the feeding stations foraging for spilt seed. Wood Mouse have large ears (compared to the common house mouse) and long tails. 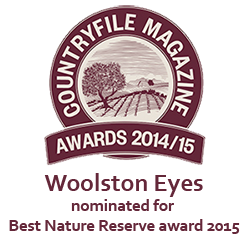 The best chance of seeing Brown Rat is foraging under the bird feeders on No3 Bed. The only record of this rodent is referenced in the 1980 by K Dunne, R Barber and H Fisher Warrington New Town Ecological Survey, which is copied at the end of this mammalia setion. 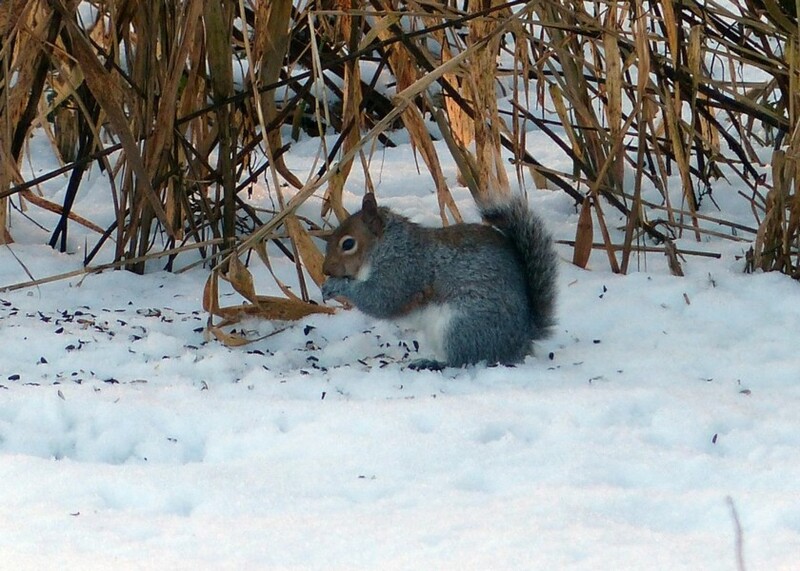 Grey Squirrels numbers have increased dramatically on the Reserve and surronds in recent years and sightings have moved from occasional to common. One of the largest members of the lagomorpha, the body length of 480 to 750mm and weight of 2.5 to 7kg bears testament to that status. Unmistakable long hind legs and ears with characteristic black patches viewed from the back. Record date back to early years when grassland was much more extensive across the Eyes. 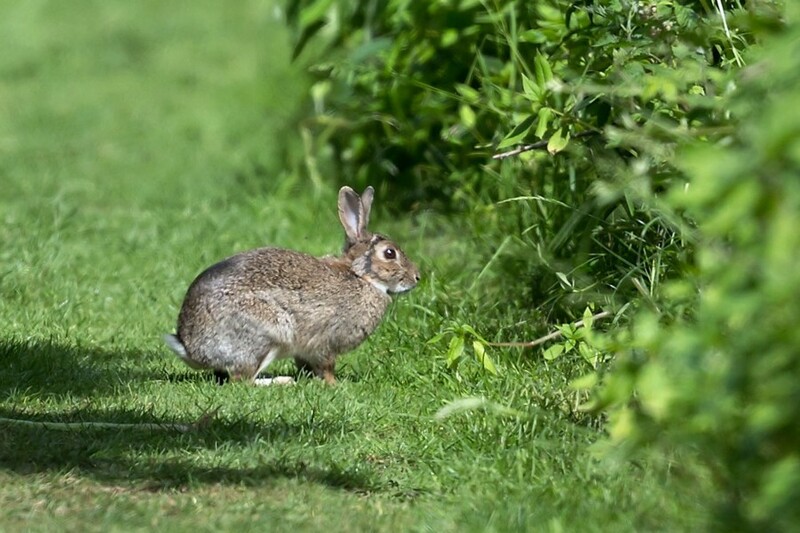 Rabbits are extremely common on the reserve particularly on the sandier banks and dense bramble cover along the Ship Canal track and boundaries of the four beds. Our only member of the ‘spiny’ mammal family and are unlike any other UK mammal thus being universally recognised, although generally nocturnal in habit. Their main predator is the badger. Generally subterranean the ‘molehills’ (spoil from their tunnels) are the first sign of their presence which are now evident on the reserve. At 75mm (3 inches) this species is difficult to spot and is often only seen crossing a pathway or deceased on a pathway although active day and night. It is one of the most common Shrew on the Reserve and an important food prey for the carnivorous mammals, Kestrel and Owls. At 50mm (2 inches) this is 2/3rds the size of the Common Shrew and although common is seldom seen although active during the day and night. It is distinguished from the similar Common Shrew by its bi-colour coat, brownish grey on top and whitish beneath. Common Shrew exhibits tri-colouration, dark on top shading to brownish grey then white underneath. Bats are naturally very difficult to observe and identification is generally obtained from studies of the echolocation frequencies individual species use. Daubenton’s Bat call frequencies range from 32 to 85kHz but typical calls peak at 45 to 50kHz. This species is associated with water, preferring woodland habitat, bridges, buildings etc. adjacent to water. Daubenton’s is a medium to small bat being 45 to 55mm with a wing span of 240mm to 275mm and a weight between 7g and 15g. Common Noctules have two common calls the frequencies of the first range from 26 to 47kHz, most energy being at 27kHz and last for 11.5ms. The second call frequency is 22 to 33kHz, having most energy at 22kHz and having most energy at 22kHz and a typical duration of 13.8ms. This species prefers wooded areas and typically flies above and around the canopy. The Common Noctule is a large bat being typically 80mm with a wing span of 350mm. The Common Pipestrelle is the smallest bat in Europe being 45 to 55mm with a wing span of 180mm to 250mm and a weight between 3.5g and 8.5g. It is very common on and around the Reserve and can be encountered feeding on small insects at dusk and dawn along tree lines and clearings. Common Pipistrelle Bat call frequencies range from 45 to 76kHz, have most energy at 47kHz and last for 5.6ms. The Soprano Pipestrelle was only separated from the Common Pipistrelle Bat in 1999 which it closely resembles in all aspects (see Common Pipistrelle above) other than echolocation frequencies. Soprano Pipistrelle call frequencies range from 53 to 86kHz, have most energy at 55kHz and last for 5.8ms. Our most widespread native deer who do not form herds but live generally as solitary individuals or small family groups. A relatively small deer standing around 100cm at the shoulder and is generally reddish brown in colour, more so in the summer months, and a white tail patch. Only the male carries antlers which are short, even in older bucks are only around 200mm long and generally only developing two or three points. Roe Deer are accidental visitors to the Reserve, not resident and infrequently seen. 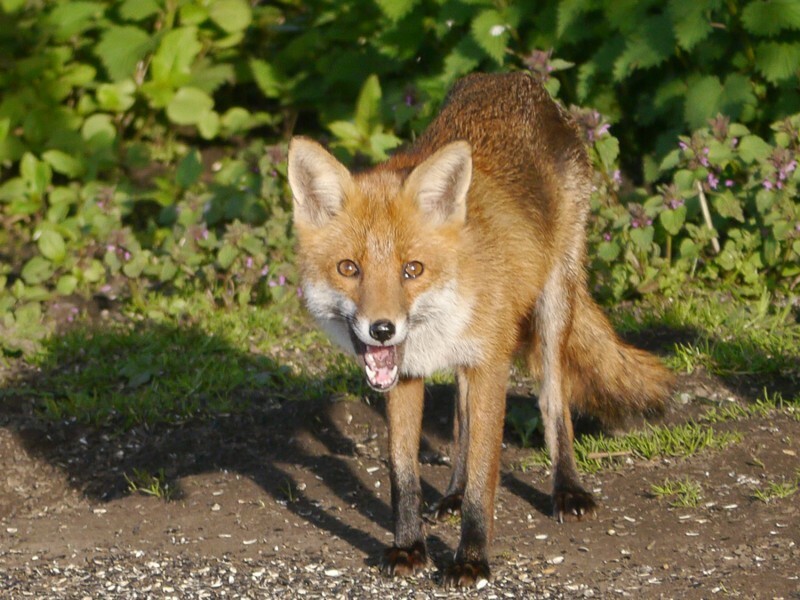 Largely nocturnal but can be sighted anywhere on the Reserve especially during the breeding season when feeding young. A recent times accidental near visitor to the Eyes. One spent some time in the River Mersey adjacent to the northern edges of No.4 and No.3 Beds in the spring of 2000. 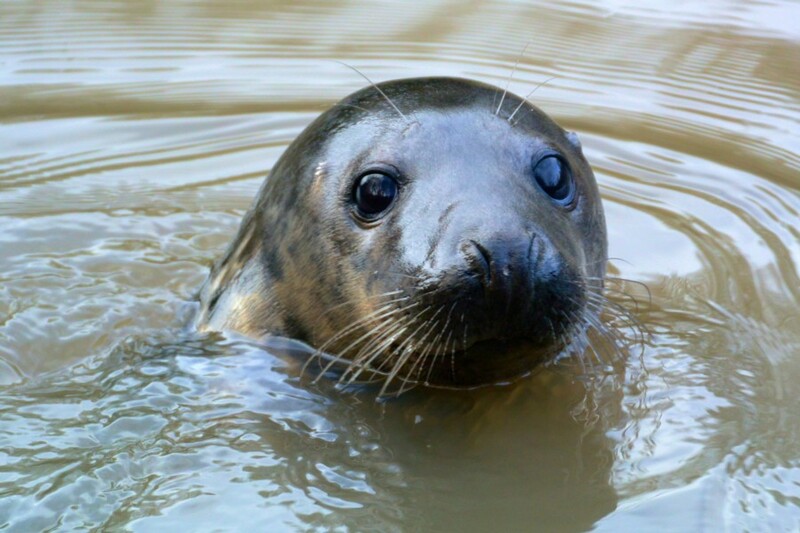 Another seal was located on nearby Howley Weir in 2012. It is thought these seals follow the first salmon runs into the river from Liverool Bay. Very similar to the Weasel but larger and has a black tip to the tail. Ermine is the name given to Stoat in the characteristc white winter coat. This secretive mammal is infrequently recorded on the Reserve. The Weasel is smaller than the related Stoat and is the one without the black tip to the tail. 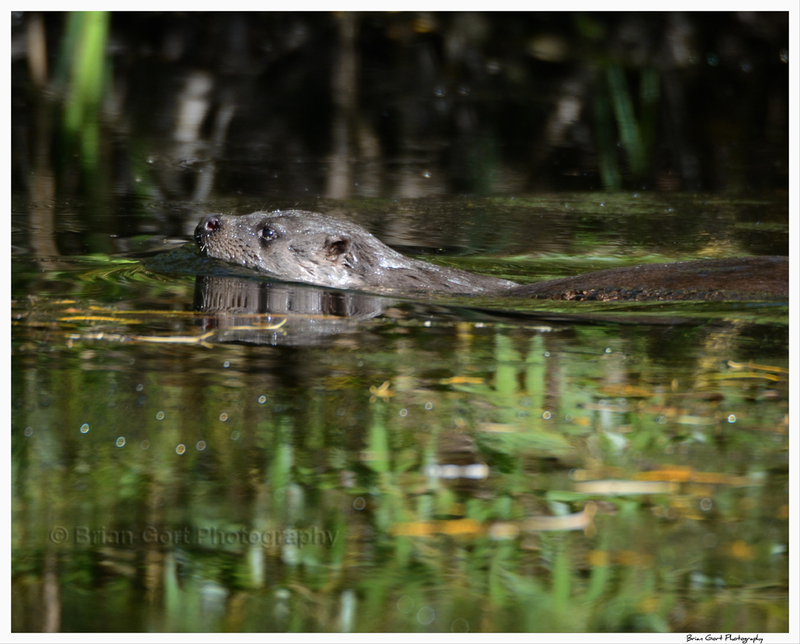 The first record of Otter was of one seen and photographed on the old river under the footbridge to No.3 Bed on 3rd September 2014. Badgers are nocturnal. Sightings on the Reserve are infrequent but the evidence of their existance is widespread and along the pathways in particular were their ‘grubbings’ for earthworms and larvae in the short grass can be seen daily. They are most frequently seen on No.3 Bed, walking along or crossing the paths and foraging under the feeders around the John Morgan Hide. Mink are now widespread in the UK and Woolston has maintained a popoulation for a number of years. Equally at home in the water as on land they are serious predators and pose a threat to our breeding birds, especially young and juvenile wildfowl. Sightings on the Reserve are regular but infrequent. The following data is from the “MANAGEMENT PLAN” published in 1985 and from Annual Reports of 1980 onwards. Nos - see notes at the end of the table. Warrington New Town Ecological Survey 1980 - K Dunne, R Barber, and H Fisher.